The name McColloch appears to have originated from the Scottish surname MacCulloch or McCulloch. 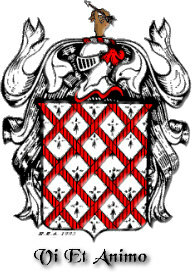 The Achievement of Arms associated with the McColloch name would then be the same as that of the Ancient Scottish Clan MacCulloch of Myreton. The MacCulloch Achievement of Arms was drawn by an heraldic artist from information officially recorded in ancient heraldic archives. Documentation for the MacCulloch Achievement of Arms design can be found in Burke's General Armory. "A hand throwing a dart ppr." "A hand throwing a dart; natural colored."